The story of the Civil War is often told as a conflict in which the Bolsheviks were forced to fight by the Whites and the Allied intervention in Russia. In this left-wing version of events the Reds were not to blame for the ‘extraordinary measures’ they were forced to take in the Civil War—the rule by fiat and terror, the requisitionings, mass conscriptions and so on—because they had to act decisively and quickly to defend their revolution against counter-revolutionaries. But this misses the whole point of the Civil War and its relationship to the revolution for Lenin and his followers. Lenin was prepared for a civil war and perhaps even welcomed it as a chance to build his party’s power base. The effects of such a conflict would be predictable: the polarization of the country into ‘revolutionary’ and ‘counter-revolutionary’ sides; the extension of the state’s military and political power; and the use of terror to suppress dissent. In Lenin’s view all these things were necessary for the victory of the Dictatorship of the Proletariat. He often said that the defeat of the Paris Commune was explained by the failure of the Communards to launch a civil war. Marx’s Capital had been published in Russia as early as 1872. It was the book’s first foreign publication, just five years after the original German edition and fifteen years before its appearance in English. The tsarist censors had passed it by mistake, assuming that ‘very few people in Russia’ would read the heavy tome of political economy, and ‘even fewer understand it’. Contrary to expectations, Marx’s critique of the capitalist system would lead to revolution earlier in Russia than in any of the Western societies to which it had been addressed. Here perhaps was the root of Marxism’s attraction to the Jews, who played such a conspicuous role in the Social Democratic movement, providing many of its leaders (Trotsky, Martov, Axelrod, Kamenev and Zinoviev, to name just a few). Where Populism had proposed to build on peasant Russia—a land of pogroms and discrimination against the Jews—Marxism offered a modern Western vision of Russia. It promised to assimilate the Jews into a movement of universal human liberation—not just the liberation of the peasantry—based on principles of internationalism. Even the young Lenin only became fully converted to the Marxist mainstream in the wake of the famine crisis. Contrary to the Soviet myth, in which Lenin appeared as a fully fledged Marxist theorist in his infancy, the leader of the Bolshevik Revolution came late to politics. In his last school year he was commended by his headmaster (by an irony of fate the father of Kerensky, his arch-rival in 1917) as a model student, ‘moral and religious in his upbringing’, and never giving ‘cause for dissatisfaction, by word or deed, to the school authorities’. The totalitarian state had its origins in War Communism, which attempted to control every aspect of the economy and society. For this reason the Soviet bureaucracy ballooned spectacularly during the Civil War. The old problem of the tsarist state—its inability to impose itself on the majority of the country—was not shared by the Soviet regime. By 1920, 5.4 million people worked for the government. There were twice as many officials as there were workers in Soviet Russia, and these officials were the main social base of the new regime. This was not a Dictatorship of the Proletariat but a Dictatorship of the Bureaucracy. Joining the Party was the surest way to gain promotion through the ranks of the bureaucracy. From 1917 to 1920, 1.4 million people joined the Party, nearly all from lower-class and peasant backgrounds, and many through the Red Army, which taught millions of conscripts how to think and act like ‘Bolsheviks’, the foot-soldiers of a disciplined revolutionary vanguard. The leadership was worried that this mass influx would reduce the Party’s quality. Levels of literacy were very low (in 1920 only 8 per cent of Party members had more than four years of primary schooling). As for the political literacy of the rank and file, it was rudimentary: at a Party school for journalists none of the students could say who the British or French leaders were, and some believed that imperialism was a republic somewhere in England. But in other ways this lack of education was an advantage for the Party leaders, for it underpinned their followers’ political obedience. The poorly educated rank and file mouthed the Party’s slogans but left all critical thinking to the Politburo and the Central Committee. As the Party grew it also came to dominate the local Soviets. This involved a transformation of the Soviets—from local revolutionary bodies controlled by an assembly to bureaucratic organs of the Party-state where all real power was exercised by the Bolsheviks, who dominated the executives. In many of the higher-level Soviets, especially in areas deemed important in the Civil War, the executives were not elected: the Central Committee in Moscow simply sent in commissars to run the Soviets. In the rural (volost’) Soviets the executives were elected. Here the Bolsheviks’ success was partly due to the open system of voting and intimidation of voters. But it was also due to the support of the younger and more literate peasants who had left the village in the First World War and returned in the Civil War. Newly skilled in military techniques and organization, and well versed in socialist ideas, these were the peasants who would join the Bolsheviks, and dominate the rural Soviets by the end of the Civil War. In the Volga region, for example, where this has been studied in detail, two thirds of the volost’ Soviet executive members were literate peasant males under the age of thirty-five and registered as Bolsheviks in the autumn of 1919, compared with just one third the previous spring. In this sense the dictatorship depended on a cultural revolution in the countryside. Throughout the peasant world Communist regimes have been built on the ambition of literate peasant sons to join the official class. One-party-dominated democracies always fighting a War on This and a War on That against their internal enemies display the same tendencies. In the big industrial cities there was a similar process of radicalization in the wake of the Kornilov crisis. The Bolsheviks were the principal beneficiaries of this, winning their first majority in the Petrograd Soviet on 31 August. The Soviets of Riga, Saratov and Moscow fell to them soon afterwards. The rising fortunes of the Bolsheviks were due mainly to the fact that they were the only major political party which stood uncompromisingly for ‘All power to the Soviets’. This point bears emphasizing, for one of the most basic misconceptions about the October Revolution is that the Bolsheviks were swept to power on a tide of mass support for the Party. They were not. The October insurrection was a coup d’état, actively supported by a small minority of the population, but it took place in the midst of a social revolution, which was focused on the popular ideal of Soviet power. After the Kornilov crisis there was a sudden outpouring of resolutions from factories, villages and army units calling for a Soviet government. But almost without exception they called on all the socialist parties to participate in its establishment, and often showed a marked impatience with their factional disputes. The real significance of the Kornilov Affair was that it reinforced the popular belief in a ‘counter-revolutionary’ threat against the Soviet—a threat the Bolsheviks would invoke to mobilize the Red Guards and other militants in October. In this sense the Kornilov Affair was a dress rehearsal for the Bolshevik seizure of power. The Bolshevik Military Organization emerged from the underground—where it had been since July—with renewed strength from its participation in the struggle against Kornilov. The Red Guards were also reinforced: 40,000 of them had been armed in the crisis. As Trotsky later wrote, ‘the army that rose against Kornilov was the army-to-be of the October revolution’. The growth of mass-based nationalist movements was contingent on the spread of rural schools and institutions, such as peasant unions and cooperatives, as well as on the opening up of remote country areas by roads and railways, postal services and telegraphs—all of which was happening very rapidly in the decades before 1917. The most successful movements combined the peasants’ struggle for the land (where it was owned by foreign landlords, officials and merchants) with the demand for native language rights, enabling the peasants to gain full access to schools, the courts and government. This combination was the key to the success of the Ukrainian nationalist movement. In the Constituent Assembly elections of November 1917, the first democratic elections in the country’s history, 71 per cent of the Ukrainian peasants would vote for the nationalists—an astonishing shift in political awareness in only a generation. The movement organized the peasants in their struggle against foreign (mainly Russian and Polish) landowners and against the ‘foreign influence’ of the towns (dominated by the Russians, Jews and Poles). It is no coincidence that peasant uprisings erupted first, in 1902, in those regions around Poltava province where the Ukrainian nationalist movement was also most advanced. Throughout Russia the impact of modernization—of towns and mass communications, the money economy and above all rural schools—gave rise to a generation of younger and more literate peasants who sought to overturn the patriarchal village world. Literacy rose from 21 per cent of the empire’s population in 1897 to 40 per cent on the eve of the First World War. The highest rural rates were among young men in those regions closest to the towns (nine out of ten peasant recruits into the Imperial army from the two provinces of Petersburg and Moscow were considered literate even by 1904). The link between literacy and revolution is a well-known historical phenomenon. The three great revolutions of modern European history—the English, the French and the Russian—all took place in societies where the rate of literacy was approaching 50 per cent. Literacy promotes the spread of new ideas and enables the peasant to master new technologies and bureaucratic skills. The local activists of the Russian Revolution were drawn mainly from this newly literate generation—the beneficiaries of the boom in rural schooling during the last decades of the old regime, now in large enough numbers to pass on the new ideas to those still illiterate. In its belated efforts to educate the common people, the tsarist regime was helping to dig its own grave. From the beginning of the Meiji period in the late 1800s, the military achieved unswerving discipline through a culture of physical abuse. As Japanese historian Yuki Tanaka would later explain: "Discipline was conducted through bentatsu [鞭撻 'whip-strike'] (the routine striking of soldiers), which was presented as an 'act of love' by the officers for the soldiers. Even the Japanese Navy—which was far more Westernized in conduct than the Army—adopted a practice of harsh discipline known as tekken seisai (the iron fist) [鉄拳制裁 'ironfist punishment'] in the wake of the Russo-Japanese War. It was often called the ai-no-muchi, or ‘whip of love’ [愛の鞭 'love's whip']." THERE WERE SEVERAL mastas [white men] on New Britain and many of the other islands in the Bismarcks and Solomons, all linked by radio to a secretive unit called Ferdinand. Developed at the beginning of the war by two officers in the Royal Australian Navy (RAN), the organization took its name from the 1936 picture book The Story of Ferdinand. The Aussies were more familiar with Walt Disney’s cartoon adaptation, “Ferdinand the Bull.” By the time the cartoon reached movie houses in Australia, Europe was on the threshold of war. Enter the naval intelligence director, Cmdr. Rupert Basil Michel Long, RAN. A World War I veteran, he realized that the hundreds of landowners along Australia’s coast and those living among the islands in the Mandated Territory of New Guinea could be organized into a network connected by two-way radios. Most already had the equipment. At the time, the state of the art in long-distance communications was low-frequency (LF) radio, known to most Australians as “wireless.” Compared with high-frequency radio waves, which provide excellent clarity over short distances (but quickly loose strength and are easily bent or turned by obstacles), low-frequency signals travel great distances without degrading. The government had a monopoly on two-way radio equipment in those days, having purchased a majority share of Amalgamated Wireless of Australasia (AWA) stock in 1922. So the company was obliged to provide communication services across the continent as well as to the hundreds of populated islands in the mandated territory. Two-way radios were essential for relaying messages and news among the plantations, airstrips, mines, and settlements across the Pacific islands, many of which were separated by hundreds of miles. Commander Long aimed to organize hundreds of civilians into a unified coastwatchers organization. In 1939 he appointed Eric A. Feldt, then a government administrator in New Guinea, to run the network in the islands from a headquarters in Port Moresby. A former RAN officer, Feldt was given a lieutenant commander’s stripes and spent several months traveling “by ship, motor boat, canoe, bicycle, airplane, and boot” along the coast of New Guinea, through the Bismarcks, down the Solomon chain, and finally to the New Hebrides. His four-thousand-mile journey achieved brilliant results. In the coming years, the coastwatchers would provide useful intelligence and perform extraordinary feats, many at the cost of their lives. Throughout 1944 and well into 1945, bombers, dive-bombers, and fighter-bombers continued to hit Rabaul’s airfields to prevent their use; they kept a watchful eye on Simpson Harbor and attacked barges trying to resupply the garrison; they destroyed gardens to prevent the Japanese from growing food; and they strafed vehicles hauling supplies from remote caches. The number of sorties per month gradually declined, from a peak of approximately 2,200 in January 1944 to less than 300 by December. At the lowest ebb, an average of ten planes hit Rabaul every day, and the effort surged again in mid-1945 to more than five hundred sorties per month. Of all the missions flown against Rabaul—or even throughout all of World War II—few were as unusual as the sixteen one-way sorties by unmanned “assault drones” in October 1944. Almost seventy years before the proliferation of unmanned aerial vehicles (UAVs) such as those used in the Global War on Terror, expendable radio-controlled drones were used to attack Rabaul. The TDR-1 looked conventional in almost every respect, with two inexpensive Lycoming six-cylinder engines, tricycle landing gear, and the capability to carry an external bomb or torpedo. A cockpit with flight controls was included for test or ferry flights, then faired over for the unmanned attack. Equipped with an RCA television camera in the nose, along with a gyro stabilizer and radar altimeter, the drones were flown by an operator in a stand-off TBM (General Motors–built) Avenger using radio control. Almost two hundred drones were manufactured, using lightweight tubular frames supplied by the Schwinn Bicycle Company, before the contract was cancelled. Most of the completed TDRs were shipped overseas with a unit called the Special Task Air Group (STAG)-1. Before launching the drones against enemy targets, a live demonstration was conducted on July 30 for the benefit of the ComAirSols [Commander, Aircraft, Solomon Islands] brass. Four drones carrying two-thousand-pound general purpose bombs were directed by their control planes against Yamazuki Maru, a 6,500-ton merchantman beached on Guadalcanal. Technically the drones scored three direct hits, although one bomb failed to detonate. The fourth drone missed the superstructure by a matter of feet, exploding against the tree line. On the heels of that success, two missions were conducted against ships off southern Bougainville, along with other well-defined targets such as antiaircraft emplacements. Initial results due to malfunctions and equipment failures were disappointing. Nevertheless four separate strikes were flown against Rabaul by STAG-1 in October. Flying from Nissan in the Green Islands, each strike consisted of four drones for a total of sixteen sorties against Rabaul. A great majority either missed due to radio interference or malfunction, or crashed en route. (One of the wrecked drones was partially recovered by the Japanese, who discovered that the lightweight generator assembly and a sparkplug from one of the engines made an excellent cigarette lighter.) The last strike, on October 27, resulted in one direct hit on a secondary target, and a couple of hits on buildings near their intended target. The following day, the program was officially terminated. In 1854, while Commodore Matthew C. Perry's U.S. Navy squadron was surveying the future treaty port of Hakodate on Hokkaido in 1854, two sailors aboard the USS Vandalia died. Seaman James C. Wolfe died on 25 May and Seaman G. W. Remick died on 27 May 1854. Both were interred in a seaside plot in what later became the city's Foreign Cemetery, now a tourist attraction. In 1860, as a result of Perry's efforts in Japan, the Tokugawa Shogunate dispatched its first embassy to the United States aboard the Kanrin Maru, a Dutch-built ship skippered by Katsu Kaishū. Also aboard was Fukuzawa Yukichi, perhaps Japan's most effective early Westernizer. The Kanrin Maru stopped at Honolulu on its return voyage to Japan, and so did many other ships of the fledgeling Imperial Japanese Navy after the Meiji Restoration of imperial rule in 1868. Many of the earliest Japanese immigrants to Hawai‘i in 1868 and 1886 were interred in Makiki Cemetery, which thus came to include the first Japanese cemetery in Hawai‘i. In 1876, (Apprentice?) Seaman Second Class (二等若水夫 nitou waka suifu '2-class young waterman') Arakawa Matajuro (荒川又十郎) of HIMS Tsukuba (筑波) died and was buried in what became the first Japanese Navy cemetery outside Japan. Twelve more enlisted men from the ironclad Ryūjō (龍驤) were buried in 1883. 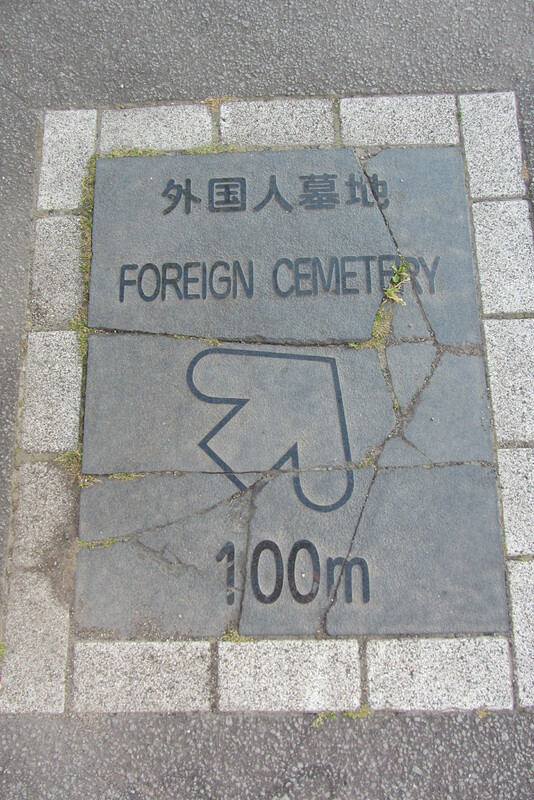 By 1899, seventeen IJN sailors were buried there. The most interesting gravestone is that of Midshipman K. Hara of HIMS Takachiho (大日本軍艦高千穂), who died on 8 April 1894. ('Midshipman' translates 海軍少尉候補生 kaigun shōi kōhosei 'navy ensign cadet'.) Hara's is the only marker engraved in both English and Japanese. The former gives his year of death as 1894, while the latter says he died in Kigen 2554, exactly 660 years later. The Kigen (紀元 'record-origin') calendar dates from 660 BC, when the Japanese empire's mythical founder, Emperor Jimmu, is said to have begun his reign. Kigensetsu (紀元節 'record-origin-season'), 11 February, became a national Shinto holiday and festival season in 1872, during the early years of Emperor Meiji's reign, but was abolished after World War II, then re-established in 1966. The British-built, Naniwa-class cruiser Takachiho is also an interesting story. It is named for the town of Takachiho (in Miyazaki Prefecture), where Emperor Jimmu's brothers are supposed to have come from; where his progenitor and Japan's creator deity, the Sun Goddess Amaterasu, is said to have spent time in a cave, hiding her light, before being lured back out; and to which Amaterasu later dispatched her grandson Ninigi to plant rice and found Japan's imperial line. In the much more recent and less mythical past, the cruiser Takachiho had visited Honolulu in 1893, to protect its Japanese citizens and to show concern about the overthrow of the Hawaiian monarchy. Makiki Cemetery lies on the outer slopes of Punchbowl Crater, which later became the National Memorial Cemetery of the Pacific, housing the remains of thousands of members of the U.S. military, many of whom died fighting against Japan during the Pacific War (1941–45). It may seem ironical to have an Imperial Japanese Navy cemetery just below Punchbowl, but the Makiki Japanese cemetery marks a much longer period—a sesquicentennial—of productive cooperation between the United States and Japan. Labels: Japan, language, migration, military, U.S.